The story of Jason and the Argonauts is one of the most famous tales of Greek mythology, and the story of the quest to obtain the Golden Fleece has been told and retold for countless generations. Jason was of course the leader of the expedition, but the band of heroes he travelled with were collectively called the Argonauts, for they were voyagers upon the ship Argo. When Jason arrived in Iolcus to claim the throne from King Pelias, Pelias proclaimed that if he was to give his kingdom to Jason, then Jason would have to give him the legendary Golden Fleece. The Golden Fleece though was located in Colchis, a barbaric land at the furthest extreme of the known world, at the far edge of the Black Sea. 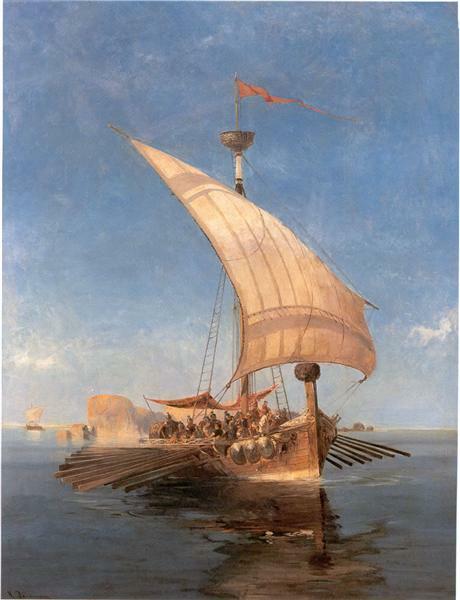 To get there from Iolcus meant sailing across the Mediterranean, through the Hellespont, and across the Black Sea, it was a voyage that no vessel yet constructed could hope to complete, and so Jason had to build a new one. Jason was being aided in his quest by the goddess Hera, who was actually manipulating the young man for her own reasons, but Hera enlisted the help of another goddess, Athena, Greek goddess of wisdom, to provide a vessel for Jason to use. So Athena came up with a new ship design, a design which would enable the vessel to make the longest sea trip yet undertaken. So, as heroes from across the Ancient World arrived at Pagasae Harbour, to join Jason on his quest, a new ship started to be built; and whilst construction was undertaken by a man called Argos, Athena was also said to have assisted in the building of the ship. The identification of Argos differs between the ancient sources, and whilst often called a son of Arestor from the city of Argos, the builder Argos is also sometimes named as a son of Phrixus, and thus a grandson of Aeetes, King of Colchis. No plans of course survive of just what the new vessel looked like, but it is probably safe to assume that it was a galley design typical of those sailed later in Ancient Greece, with this new ship said to be pulled by 50 oars. The most impact aspect of the construction of the new ship though, was the fact that part of the prow of the vessel was made from oak taken from the forest of Dodona. Dodona was a sacred area in Ancient Greece, a region heavily linked with the god Zeus and prophecy, and the Oracle of Dodona was considered second only to the Oracle of Delphi in the ancient world. Thus, using oak from the sacred forests imbued the vessel with mystical powers, and the ship was said to be able to speak, and to offer up prophecies of its own. Once constructed, it was time to give the vessel a name, and thus it was called the Argo. Two reasons are put forward for why the ship was called the Argo; firstly in recognition of the man Argos who had built it, and secondly because the Greek word argos means “swift”. With the Argo built, a band of heroes collected, and Jason elected leader, it was time to leave Iolcus, and in some versions of the story of the Argonauts, it was the Argo itself who announced that the time had arrived to set sail. Thus, the Argo left the beach at Pagasae. The journey to Colchis was a long one, and the sailors of the Argo faced many trials and tribulations on the islands of Lemnos and Samothrace, as well as Ares’ Island. 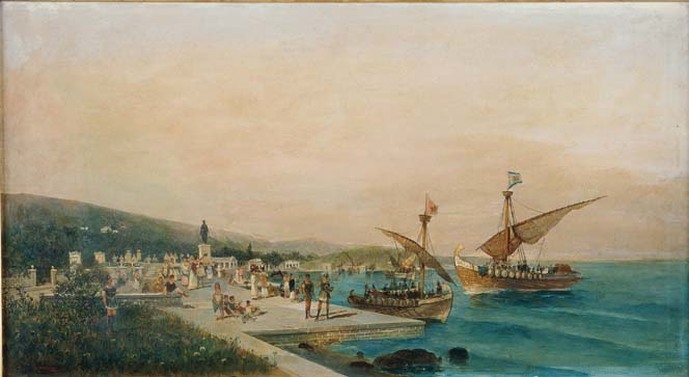 The Agro itself also had to deal with its own problems, for it had to deal with gigantic waves as it passed Hellespont, and also deal with the Symplegades, the Clashing Rocks, at the Bosphorus, the latter of course being dealt with when the Argonauts set to their oars with great vigour. At Colchis, the Argo was anchored as most of the Argonauts went ashore, but soon it was time to make a rapid retreated from Colchis, for Jason, with Medea in tow, had removed the Golden Fleece from Ares’ sacred grove. To slow down the pursuit of the Colchian navy and Aeetes, Medea and Jason killed Apsyrtus, Aeetes’s son, and dismembered the body, throwing body pieces into the sea. This violent act though ensured that there was no easy journey for the Argo back to Iolcus, and many more dangers, and a much longer journey now faced the Argo and its crew. The return voyage would see the Argo on the River Danube, sailing by Italy, Elba, Corfu, Libya and Crete. Indeed, in Libya, the Argo was actually carried by its crew across part of the desert. The return journey of the Argo would also see the ship having to deal with the twin dangers of Scylla and Charybdis, just as Odysseus would have to do a generation later. In the end it was the Argo itself who advised Jason how the Argonauts could finally make it back to Iolcus, for the Argo advised that Jason would have to visit the sorceress Circe to acquire absolution for the murder of Apsyrtus. Absolution would see a more rapid return to Iolcus, and the Argo was soon once again upon the beach of Pagasae, allowing Jason, Medea, the Argonauts and the Golden Fleece to disembark one last time. Whilst the Argo would never sail again, in recognition for its role in the quest, the likeness of the Argo was placed amongst the stars as the constellation Argo Navis. The fact that the Argo was left upon the beach of Pagasae is not actually the end of the tale of the Argo, for years later it appeared again in the story of Jason. Jason was now a broken man, for after rejecting Medea, the Colchian sorceress had killed their sons. Thus, after much wandering, Jason arrived at Pagasae, and laid down for a while beneath the rotting hulk of the Argo. As he rested though, the piece of the prow made from the Dodona oak fell upon the hero, killing Jason, and ending the story of the Greek hero.